I'm Larry Wright, aged 43, a Sunbeam owner since 1985 and a Tiger owner since 1991. I've belonged to TE/AE for 15 years, CAT for nine and the Tiger e-mail list for almost five. 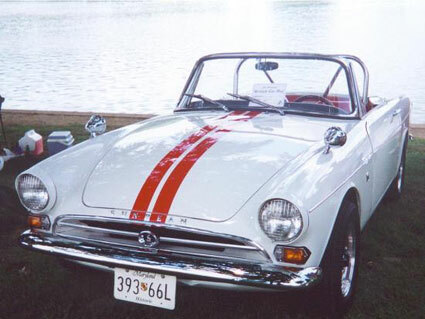 My interest in 'Beams began in 1976, when as a college-age autocrosser I first saw Sunbeam stalwart Wally Swift tow in his Alpine 'crosser behind his Tiger; I decided if I ever bought a "trad" British car, it would be a Sunbeam. "The Garage Queen", Tiger MK1 #B9471418, came into my hands through an estate sale, and an estate sale is the only way I'll ever part with it. The car got extensive bodywork and Glasurit paint in '93, a Ford MotorSports GT-40 302 and 5-speed in '95, a full leather "Martha Wheat" interior in '97 and a "full-boogie" suspension and brake upgrade in '99, among other improvements. Now, I'd just like to drive the car occasionally. As a frequent contributor to the Tiger list, his experiences and depth of knowledge are well known. Larry Wright on "Online Showoff"
Winning first place with his car, labled as a "Suzuki" !! !